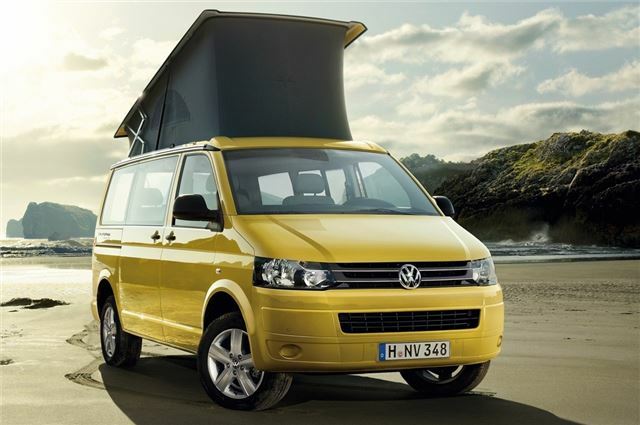 Volkswagen is launching a new entry-level model in its camper range - the California Beach. The newcomer is priced at £34,960 on the road - around £7000 less than the current cheapest Calfornia - and is a sort of halfway house between a Caravelle people carrier and the California camper. Inside there is seating for up to seven with either a two or three-seat rear bench along with optional individual chairs. The front seats swivel to face the back and there's a portable table which stores in the sliding side door. Two extra folding chairs are cleverly hidden in the tailgate. Of course this is still a camper van and has enough sleeping space for four. The bench seat folds to convert into a two-berth bed across the width of the vehicle, while a manual pop-up roof gives access to a further double bed. Integrated pull-down blinds for the side and rear windows, plus pop-up covers for the front window, ensure privacy. The California Beach is powered by a choice of 2.0-litre TDI engines. Making its debut in the Beach is a 114PS BlueMotion Technology model offering better fuel efficiency and lower emissions with a claimed 40.4mpg and 184g/km of CO2. This is helped by a five-speed manual gearbox with longer gearing, cruise control, an engine stop/start system, brake regeneration and low rolling resistance tyres. The second engine is the more powerful 140PS TDI with a six-speed manual gearbox. It's an extra £1165 over the BlueMotion Technology and returns a claimed 36.7mpg with CO2 of 203g/km. Standard equipment includes 16-inch ‘Miyato’ alloy wheels, Climatic air conditioning and a CD/radio with eight speakers while the Sunny Yellow paint and ‘Takato’ upholstery are exclusive to Beach models. Options include larger alloy wheels, a 32-litre cool/warm box, programmable parking heater, an awning, privacy glass, double glazing, Bluetooth, satellite navigation with Western Europe mapping plus xenon headlights with LED daytime running lights.